"To Infinity and Beyond: The Search for Life Beyond the Solar System"
Nate McCrady is a co-principal investigator on MINERVA, an observatory dedicated to detection and characterization of planets orbiting nearby stars. 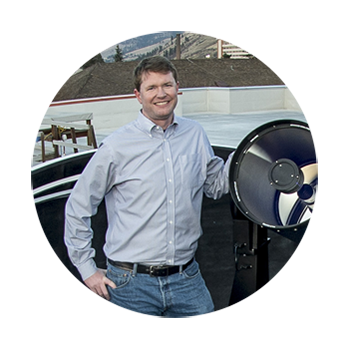 He was the recipient and lead investigator on a NASA EPSCoR grant to install and operate the University of Montana telescope in the MINERVA array in Arizona. He earned his Ph.D. in astrophysics from the University of California, Berkeley, in 2005 and joined the faculty at UM in 2009. Lecture Synopsis: The exploration for life in the universe extends beyond the bounds of our own solar system. Recent NASA missions have detected thousands of exoplanets, worlds in orbit around distant stars, and determined that they are common in our galaxy. Current NASA missions are surveying the sky to identify the most promising exoplanets for study, and upcoming missions over the next two decades will study their atmospheres and search for signatures of life.